There are a few changes to the opening round of this year’s FIA World Rally Championship – not least the absence of a ceremonial start in Casino Square. Thursday’s action kicks off from Place Desmichels in the centre of Gap rather than the middle of Monaco. And we’re then straight into two new stages on that evening. While this year’s route is 40% different from last year, the classics are still well and truly covered as the world’s most famous rally runs through Drôme, Alpes-de-Haute-Provence, Isère, Hautes-Alpes and finally Alpes-Maritimes. After three days in Gap, the action shifts south to the principality and two of the most famous stretches of road in our world: Col de Turini and Col de Braus. Both final-day stages are run twice and both are run in precisely the same configuration as last season. Looking further ahead into 2019, there’s so much to look forward to, including expanded television coverage, the return of WRC All Live, an extra round on the calendar (Rally Chile) and, of course, a second Séb on six rounds. It’s going to be a great, great year. The 3.35km (2.08 miles) shakedown stage is located on the Route de la Garde, 4.44km (2.75 miles) from the service park in Gap. The stage runs from 1000-1400 on Thursday January 24. WRC: 1 Sébastien Ogier/Julien Ingrassia (Ford Fiesta WRC) 4h18m55.5s; 2 Ott Tanak/Martin Jarveoja (Toyota Yaris WRC) +58.3s; 3 Jari-Matti Latvala/Miikka Anttila (Toyota Yaris WRC) +1m52.0s. WRC2: Jan Kopecky/Pavel Dressler (Skoda Fabia R5); WRC3:Enrico Brazzoli/Luca Beltrame (Peugeot 208 R2). The first stage of every season is always special, but this one’s even more so. There’s so much to look out for: six-time Séb in a Citroën, nine-time Séb in a Hyundai, Kris and Seb in a Toyota, Pontus in a World Rally Car… And the first time any of them push the ‘stage’ button, they’ll be doing it in the dark on a freezing Thursday night, ready for a stage they’ve never seen before. OK, they’ve seen some part of it – there’s a five-kilometre stretch of Selonnet-Bréziers in 2014 which will be familiar to some – but otherwise it’s a fast and uncompromising test which climbs sharply from the start to Col de Fillys at 1322m. After that, it’s downhill pretty much all the way to the finish. Eyes down, we’re good to go. It’s fantastic to see Kris Meeke back where he belongs – and really exciting to see him in the car which was, by the end of last season, reckoned to be the pacesetter. We’ve seen fantastic speed from Kris on this rally in the past and it’s going to be fascinating to see what he can do on his debut with the Toyota Gazoo Racing team. There’s a wee bit more interest in this car for me this year, what with one of my best mates Seb Marshall in there co-driving for Kris. I’ll have everything crossed for a solid start to the season for these boys. But, can we discount Séb [Ogier] and Julien [Ingrassia]? Probably not. Actually, definitely not. When it comes to this event, those guys seem to have a sixth sense for what’s needed to take the victory. I think it’s fair to say there’s more of a question mark over the Citroën machine than there is over the men aboard it! 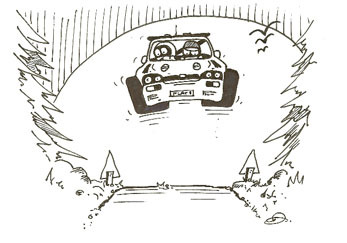 Snow is forecast on the recce and potentially into the opening day of the rally proper. Currently, the route is reckoned to be clear of sitting snow, but there is ice waiting in places like Peïra-Cava on the run down from Col de Turini. Naturally, this being the Monte, anything can happen. 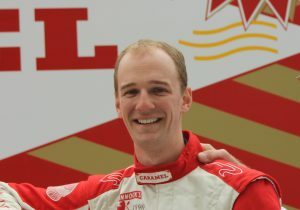 Stuart Loudon is a semi-professional co-driver who has started 104 rallies, 21 of which are rounds of the World Rally Championship and one of which was with an Ashes-winning English cricketer. He makes biscuits in the family business when he’s not working towards his dream of becoming a factory co-driver in the WRC. Stuart Loudon and Words PR work their socks off to make sure every last dot and detail of the document is 100 per cent accurate – but we can’t be responsible for any changes to the itinerary or stage distances.